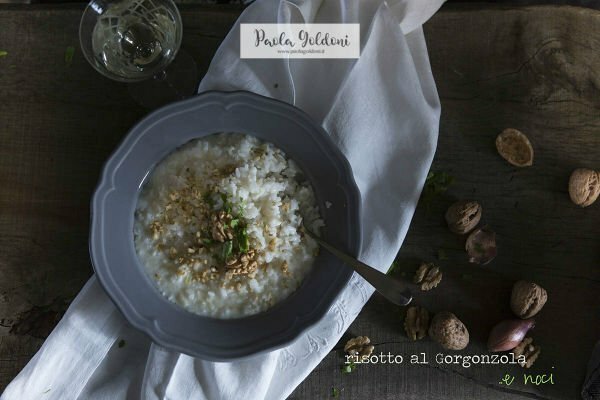 It’s thought that Risotto is a sophisticated dish, ideal for an elegant dinner, a dish that you can only eat in a fancy restaurant. Actually Risotto in Italy is a fairly common dish that is consumed at home almost daily. Knowing how to cook risotto is important and above all making a good risotto is easier than you think. Risotto is a northern Italian rice and owes its name to the way of preparing the risotto recipe. So how to cook Risotto? Told like that it’s apparently easy making a risotto but these steps are not as simple as they sound: it takes a certain technique and some important precautions. So here you are 10 tips and tricks to make Italian risotto. The best type of rice for risotto is Carnaroli. Rich in starch, this medium grain rice is easy to cook as it holds its shape during slow-cooking and absorbs the flavors of the other added ingredients. And it’s perfect for all types of risotto. Alternatively, Vialone Nano makes a deliciously smooth and creamy risotto. The round grains retain a firm texture while remaining soft, making it perfect to combine with rich ingredients like champagne, truffles or saffron. Which type of broth may i use for risotto? You can use 3 different types of broth according to the type of ingredients. In general you can use both, vegetable stock or meat stock indifferently. It all depends on the taste that we want to give our dish. But there’s only one thing absolutely mandatory: for risotto with fish and seafood, the only authorized broth is precisely fish stock. Risotto is a Northern Italian dish, born in the days when it was lightly fried in butter (or lard). And we continue to do so. 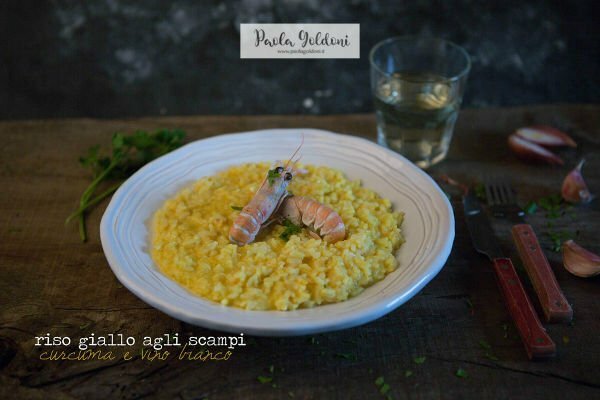 In special way if you want a creamy risotto and if you want to follow the traditional recipe. So the first move is to toast rice with butter. Add a little of extra virgin olive oil if you like but don’t cook it without butter. 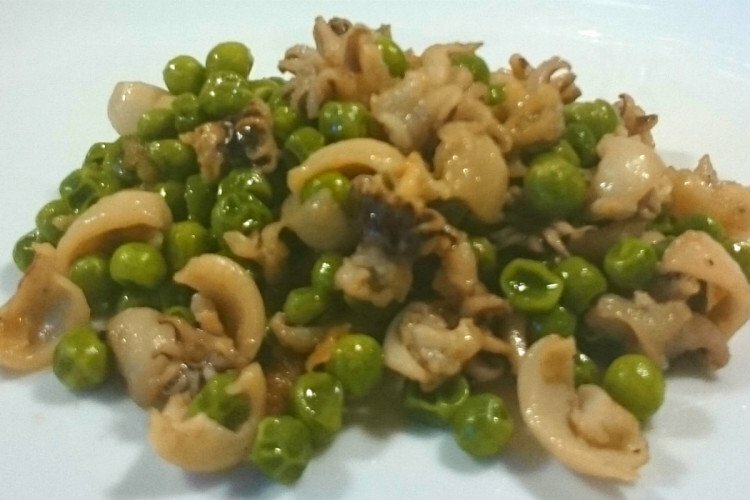 The only exception is the seafood risotto, which prefers extra virgin olive oil only. How to cook risotto with soffritto? What I use, onion or shallots? 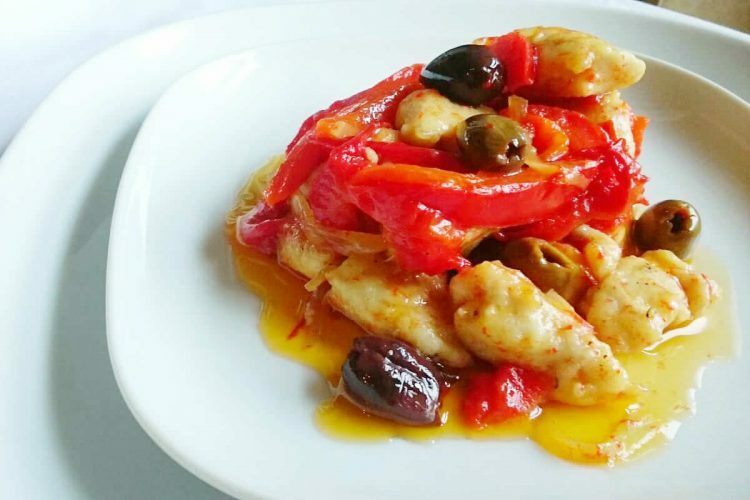 Matter of taste, but to get a more delicate flavor and to avoid the risk of covering the flavor of the other ingredients, I recommend the shallot. Of course, is not a dogma. 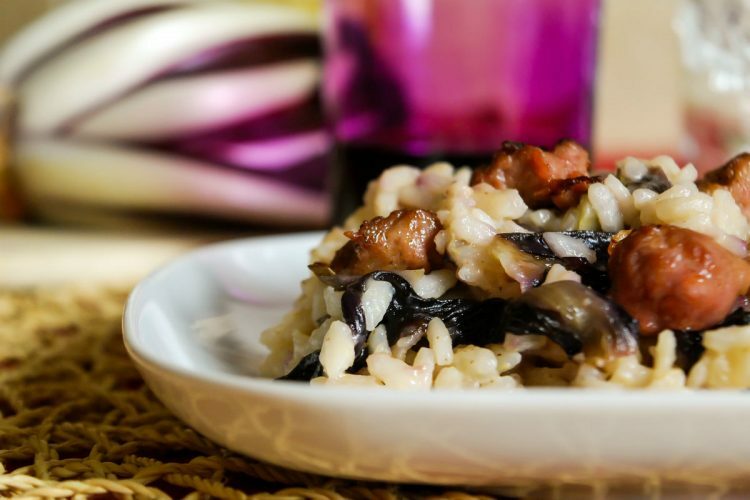 A risotto with sausage may prefer the onion, maybe Tropea red onion, which gives the dish a special flavor. The only obligation is to always chop onion and shallots finely and carefully. Toasting is the important step in risotto preparation. It’s that which most distinguishes Italian risotto from the preparation of other types of rice (compared, for example, to the Spanish paella). So, after melting the butter in a pan, add the finelly chopped shallots and cook for 2 minutes, then add the rice and stir (without water or broth). Toast it over high heat for 2 min. The toasting causes the caramelization of the grains starch and consequently a greater cooking seal. 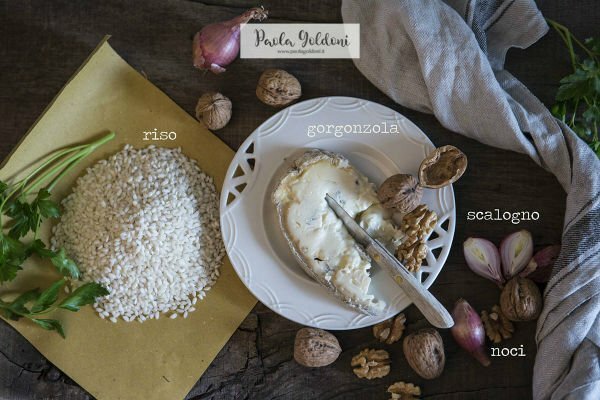 How to cook risotto with all sorts of ingredients? And how can we get the most from the ingredients that accompany the rice? The answer is to always respect the cooking time of the ingredient and add it to the rice making sure that it doesn’t overcook or remains raw. Three examples: radicchio must be added immediately after toasting; zucchini during half cooking; porcini mushrooms just before serving. The rest is left to the good sense of the man (or woman) who’s cooking. The wine is an optional ingredient. It is not suitable for all types of risotto. 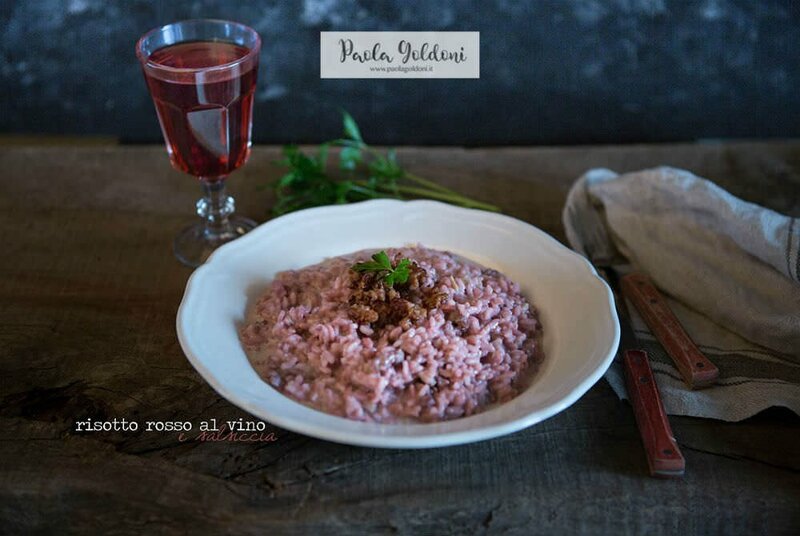 Red wine or white wine must be matched to the type of risotto. Usually the red wine goes with risotto with meat and white wine goes with seafood risotto. But much depends on the recipe and on personal taste. However, the wine should be added after toasting. When the rice is toasted, add a glass of wine and let evaporate. When I add the broth? Add the broth as soon as the rice becomes glossy and transparent and you see that it’s sticking to the pan. Add a ladle at a time and stir, so that ingredients don’t “drown” in the broth. Cook the rice in the broth without stirring constantly. Stir only when you see that the rice is drying and then add a little broth. When risotto is al dente, remove from the heat, add a knob of butter and (optional) grated Grana Padano cheese (or Parmigiano Reggiano). Cover it with the lid a couple of minutes then stir just before serving on the plates. Don’t use heavy cream, it’s not neccesary. This procedure favors the creaminess of the dish, one of the fundamental characteristics of Italian risotto. Serve it immediately and hot. If you want risotto appreciated in all its goodness it must be served and eaten warm. Now that you have learned how to cook risotto, choose high-quality ingredients and make an Italian risotto to leave your guests amazed. I love all red things, reading novels, Milan football team, spaghetti and dark chocolate. I have wonderful memories of my grandmother who Involved me in the kitchen from a very early age. She was kind and patient and generous with her time. Some of my favorite childhood memories involve being in the kitchen with her while she was cooking Risotto alla Milanese or Polenta. And the bonus of it was that she always made me taste everything. 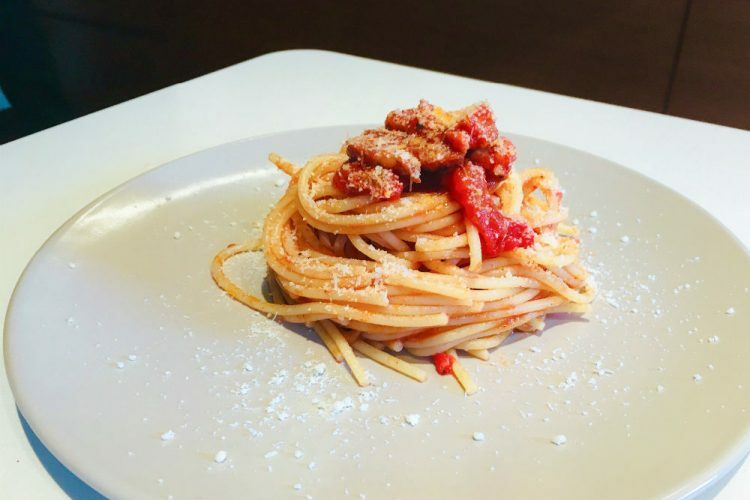 Tomato Passata, Sauce and Paste. Do you really know the difference? No Replies to "How To Cook Risotto. 10 Tips for a Perfect Risotto"